Researchers have re-written the recipe for the elements that produce salt. Halogens (Chlorine, Bromine and Iodine) form naturally occurring salts which are essential for most life forms – but too much can sterilise. Compared to meteorites that formed the Earth, the Earth should have acquired unhealthy levels of salt, and many theories have been put forward to explain the mystery of why, instead, salt concentrations on the planet are ‘just right’. The answer turns out to be quite simple – previous estimates of halogen levels in meteorites were just too high. The question of how the Earth acquired its elements has long interested scientists. In a new study, published in Nature, an international team of scientist led by the Universities of Manchester and Oxford had another look at one of the largest suites of meteorites assembled for this type of study. They used a new analytical technique designed to eliminate contamination sources. The results were a huge surprise, as time after time each meteorite measured was found to have halogen levels far lower than previously thought, and remarkably consistent between different types of meteorites. Dr. Patricia Clay, lead author of the study from the University of Manchester, explains: “No single model of Earth formation using the old meteorite measurements could easily account for the halogens we see today. Some of these models needed catastrophic planetary-wide removal of halogens without affecting related elements – which just didn’t make sense.” Professor Ray Burgess, co-author from Manchester, added “The new simplified model we have developed is a big step forward in understanding how key ingredients essential for life were brought to our planet, including water that probably helped distribute the halogens between the planetary interior and surface”. This project was funded by the European Research Council FP7 ‘NOBLE’ grant to Chris Ballentine. Find out more about the Noble lab. 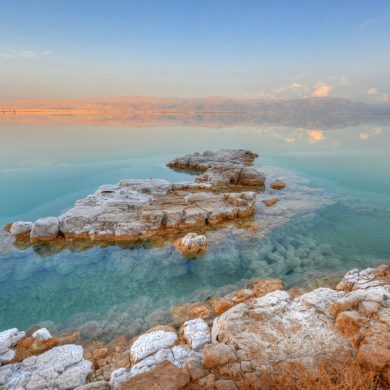 Image: Dead Sea Salt, by Tsalproject, courtesy of Creative Commons.